We, R.S. 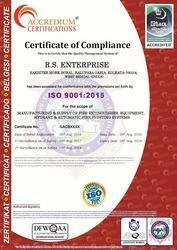 Enterprise started in the years 2016 are an ISO Certified Company and one of the foremost wholesalers traders and service provider of an extensive array of Fire Fighting Equipment. Our offered range consists of best grade Fire Fighting Equipment, Fire Alarm, and Smoke Detector. To manufacturing these products, our vendors use quality norms and top grade materials and modern machines. These products are highly appreciated in the market due to their features like perfect working, damage resistance, lightweight and durability. Apart from this, we are offering Fire License Services to our valued clients. We have associated ourselves with the renowned and leading vendors of the industry who enable us to furnish the numerous necessities of our prestigious patrons. They assist us to offer excellent quality products to our renowned customers.Our honorable vendors assist us to furnish the urgent requirements of our patrons within the predetermined time frame. In addition to this, with the support of our professionals, we are able to gain a trustworthy relationship with our clients in short span of time. We are supervised under the meticulous and stern management of our Mentor “Mr. Subrata Hazra”. Also, we have been able to gain prominence in the industry, owing to his organizational skills and ethical business policies. Owing to our immense domain experience and highly skilled team of professionals, we are meeting the exact and accurate demands of clients. We are associated ourselves with the leading and renowned vendors of the industry who enable us to furnish the numerous necessities of our prestigious customers. They assist us to offer excellent quality products to our renowned customers. Our honorable vendors assist us to furnish the urgent requirements of our honorable patrons within predetermined time frame. In addition to this, the provided products are precisely manufactured in tandem with industry quality standards.